Would any of the members have any guidance on what I should get which would be handy and do the job? Carry a couple of small ( 1 metre) scaffold planks.....we have for 36 years. If you have a single axle van you only need one ramp. I have a big yellow one that I picked up a bootfair. It gives about 3 inches of lift a couple of times I have even put blocks under the ramp to get even higher. That said most of my caravanning is done on unlevel farmers fields. So ramps are a must a bet there are people who have never used one. I am getting some so thanks for the advice, are sites generally level? Don't remember the brand but we have one ramp with a chock that you can put on the ramp. The chock is really useful. We have a few short planks as well and if you use proper sites it may be the only thing you need. > a flat "lip" that projects out in front of the lower end of the ramp. The van wheel rolls onto it a few inches before starting up the ramp. This stops the ramp sliding away when the van is pushed up it. > ones that have a chock that can be laid onto the ramp in front of the tyre. These stop the van rolling back down the ramp when you drive the car away and/or take the handbrake off. I carry a few odd lengths of decking off-cuts. I carry a pair of ramps so that if one side is low I can run the caravan back up the ramp and then put the second ramp the other way round in front of it forming a sort of cradle so there is no chance of the caravan running away. Have come from owning a Motorhome I kept my level up ramps. After 2 years I sold them on as, up until then (and to date) I never needed them. Having said that I tend to use “proper” campsites rather than CL’s etc so maybe I cannot be considered a reliable arbiter. On one single occasion I did need to be somewhat “creative” as to how I parked the caravan but other than that I have never needed one! Are you thinking of joining one of the major clubs? If so, you'll generally find their hard standings quite level. Grass could be another matter. I'd recommend diy planks plus wooden blocks to go under the feet of the cornersteadies. Thanks for that, going to use a range of providers and campsites at at first. You’re welcome. I’m sure you will enjoy your van and soon get to grips with the new hobby. The type of levelling kit depends on the type of sites and whether you are using an ALKO wheel lock. I use a pair of yellow plastic ramps as many do. We have a motor mover and an ALKO wheel lock. I run the low side up a ramp until it looks level, then push the other ramp in front (so forming a roughly level platform) and then can use the mover to move back and forth to align the ALKO wheel lock. If you use a ramp, tow the 'van forwards onto the ramp, & don't reverse onto it. If you reverse the van onto the ramp, there is a lot of "slack" in the brake which will allow the van to run back down the ramp from your carefully levelled position. I've used a Pyramid Chock master for a number of years and it's a good piece of kit. As someone ^^ said you only need one for a single axle van. And which sites would that be that have level pitches? Try going to CMC at Normanhurst Court in East Sussex, Abbey Wood in E London, or Sandringham and you will find large parts of the site have pitches that slope in more than one direction. On our last stay at Sandringham if I could have turned the caravan less than 45 deg from straight it would have been level sideways and I could have levelled it front to back in the usual way. But CMC has a rule that you must park straight on the pitch with the rear offside corner lined up with the pitch identification peg, so I had a caravan that leaned significantly to the side and had to use my ramps to get it anywhere near level. Yes I know they need rules to ensure the 6m fire gap between vans, but on the lower part of the Sandringham site on some of the pitches you could put your van sideways across the back of the pitch and <still> have 6m gap from the next van! 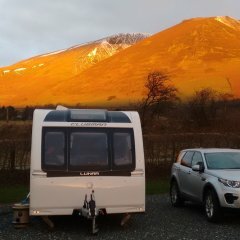 I have also been on sites where the pitch slopes backwards and on occasion have had the situation that it is not possible to get the nose low enough for the caravan to be level longitudinally. The only solution then is to use the ramps to lift the wheels so that there is enough clearance on the nose. Not nice I can assure you. I visit about 22 sites a year as I tour the UK. A mix of privately run sites and CMC sites mainly, I use wooden blocks about 15'' in length; as I have a motormover these prove long enough. It is rare that I use them but t Sandringham I had about 6'' under the offside caravan wheel. I used to carry a ramp but now that I have an ALKO wheel lock it is no where near as easy to line up as when using blocks. also handy if you have a puncture on the caravan, as you drive the flat up the ramp so you can get a jack under. I also have a couple of pieces of 1/2" nylon sheet for putting under the wheel on their own or under the ramp to give a bit more height (handy on soft soil under both wheels). another vote for the 4 part MayPole, great bit of kit. Rarely use upper bit BUT the chock is ideal as it means its stable even if stopped on the sloping part. The little flexible part stops the wheel spitting it out as you start up it as well. Other opinions are available - I've always reversed up the leveling ramp, then apply handbrake - when properly adjusted, forward motion has no slack. we use ramps, chocs, little feet and stacka feet. All have come in handy at some time or other. We used to use wood as all these things can be made easily from wood , but the plastic ones are lighter when thinking about weight. Not all hardstandings are level, the worse ones we have come across are at CMC Looe, Cornwall. If the 'van is a little bit out sideways you can always remove a bit of gravel from under the wheel on a hardstand, so long as you leave it as you found it. First rally we assisted at was as Asst.Block Marshalls at CMC National at Harewood House...bought a new 'van the week before. We were pitched on the side of a hill,as were all our Centre,however, to get our 'van partially level we had to use an entrenching tool to dig a pit for one of the rear steadies to go into....the other could not be wound down. The two front steadies were on two spare wheels, a barbecue box,three wall bricks and seven boards. So my two short planks (!) and a chock solves most things these days. You would think when building hard-standing pitches making them level would be somewhat sensible? I thought that but on a rally on a C&CC site I made that comment about a gravel pitch which was flooded..."Ah, we can't get a slope on the top of gravel to let the water off. "..no but they could put a slope under the gravel!